The vast majority of Scott 1-9 or SG 1-9 in collections or offered for sale are fakes, many of them made and sold by the Parisian stamp dealer/forger Mirza Hadi in the early 1900’s. 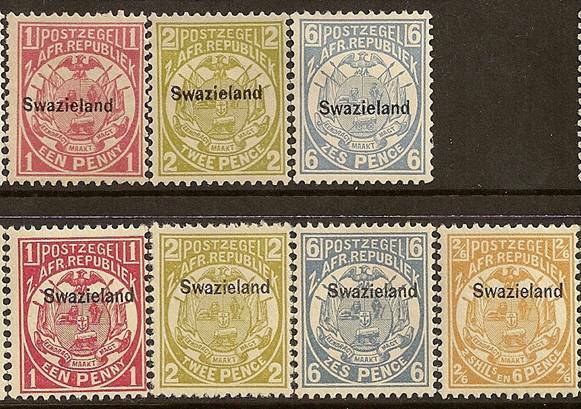 Hadi acquired or had access to large quantities of reprints of the Transvaal 1885-97 general issues (see note in SG after Transvaal Type 18) and ‘improved’ many of them with forged surcharges and overprints of the Transvaal and Swaziland issues. Note the more consistent positioning and the somewhat cleaner appearance of the forged overprints. The colors are somewhat different. Knowledgeable opinion holds that there were 60 copies of the 10s. printed. All of these should have the design off center to the lower left and the overprint centered and just below the lion and Boer in the shield. Note the slight upward tilt of the top arm of the letter ‘Z’, which is consistent on all the forgeries I have seen. There are some genuine copies with a similar tilt (Column 9?). Forgeries also have a thin right bar to the ‘w’, while most genuine have a thicker bar. This last scan illustrates an almost definitive test. 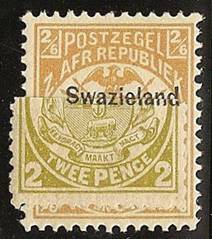 A known genuine 2 pence (expertised by Peter Holcombe and confirmed against RPSL and BPA opinions on several copies of the three top values) was cut in half through the overprint and laid on top of a known forgery (Sismondo opinion). Note the very slightly longer overprint on the genuine and the misalignment on the letters ‘land’. This is destructive testing – the 2 pence copy I use was thinned, but the stamp still serves a useful purpose. Dr. Harvey Pirie was reputedly the first to suggest this test. Other: The 5s. in the genuine set in the first scan has a clean BPA opinion. The 2s.6d. has a Sismondo opinion as a forgery. If the name ‘Mirza Hadi’ rings any bells, he was also reputedly involved in forgeries of Italy, Persia and Bushire overprints. There are other forgeries, notably by Fournier, and several fantasy overprints (see Earee’s ‘Album Weeds’).